A Kitchen is the heart of any home so it is important for you to ensure that your new Kitchen is long lasting and works well for you and your family. Here at KitchenWorld we endeavour to ensure that you are fully informed to effortlessly select all aspects of your new Kitchen. No matter the size, or budget we are on hand to advise and answer any questions you may have. All of our Kitchen, Bedroom and Bathroom cabinets are proudly British made. Whether you require bespoke sizes and configurations or like to keep things simple, we have the capability to offer what you need. A superior specification carcase encases Blum soft close hinges and high specification Blum drawer boxes. 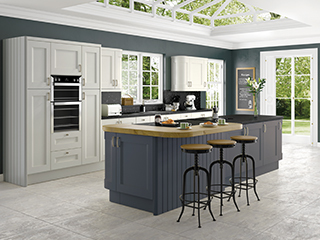 With a large variety of door styles and colours to choose from, as well as a choice of carcase colour and a vast array of handle options, each component of your Kitchen can be as unique as you are. In the relentless world of appliances, we have done the hard work for you and handpicked a select few appliance manufacturers whom we are proud to work with to deliver an extensive list of appliance options. From the Michelin starred chef inspired, innovative collection of appliances from French brand De Dietrich, to the Pioneering and sleek design legacy of New Zealand based Fisher & Paykel. Encompassing high functionality, reliability and German Heritage NordMende home appliances can provide this at prices that represent real value for money. As an independent family establishment we can also source a wide range of other appliance brands to suit your requirements including Neff, Bosch, Siemens and Miele. As with all Kitchen appliances, sinks and taps are an important aspect of your new Kitchen. We are very fortunate that we can offer a wide range of sink and tap manufacturers including the 1810 Company, Abode and Perrin & Rowe to name but a few. From Granite to Laminate, Solid Wood to Quartz, Corian to Ceramic, choosing the right material for your Kitchen worktop is essential. Factors such as durability, colour, texture, resistance to heat and lifestyle can all play a part in making this decision. 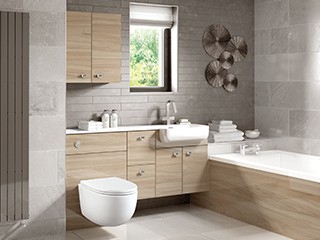 That is why we have strived to show a large selection of worktop options in our showroom. Having had the opportunity to go to some of the world’s largest worktop manufacturing plants, we are able to offer an extensive insight into all of the different work surface options available to you. Would you like our help to create a beautiful space within your home? Speak to our team today to learn more about how we can help you.